I'm about to give you some startling information so prepare yourself. (not kidding!) "Oral disease has become the number one chronic childhood illness in the U. S. " Number one. Oral disease. Just like most of you, I grew up brushing my teeth and going to the dentist. It was what everyone I knew did. My mother harped on our dental health and it wasn't until I was older that I knew why. When my mom was a child, her family was poor. Her parents never took her to the dentist. (My mom has a beautiful smile.) She was determined that we would not worry about our teeth like she always had. Flash forward a few more years to when my children were in elementary school. The school had asked for a volunteer to accompany a dental hygienist as she examined children in the lower grades (kindergarden through second grade.) I was sadly shocked at the number of children who had never been to a dentist and how many of them were suffering from oral disease. Some of the children had cavities that even I could see. It is so important to have a good dental care routine. At the heart of most dental care routines is brushing. We can't ever forget the importance of brushing your teeth, but "brushing alone misses 75% of your mouth!" 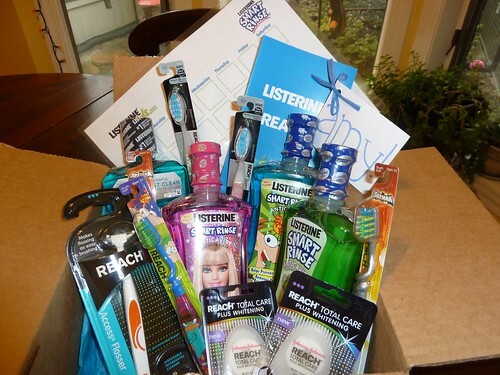 I'm thrilled to be taking part in the #SweetSmart challenge sponsored by Listerine Smart Rinse. It's a perfect time of year to focus on our dental routine. We've gotten back into the swing of things with school and homework and I have been on a fall cleaning rampage. For the next month we are going to try to refine our habits and see if we can make our dental routine even healthier. Since it's October and Halloween is looming, I can't think of a better time to make sure we are taking care of our teeth well! We are looking at our whole routine, but especially incorporating Listerine Smart Rinse mouthrinse. A little more information about Smart Rinse: "Brushing, Flossing and rinsing with a mouthrinse like Listerine Smart Rinse is an essential combination for maintaining a healthy mouth and protecting your child's teeth against cavities. It is especially designed for kids, provides 12-hour cavity protection, and strengthens teeth 99 percent better than brushing alone." I'll be posting more about the challenge to let you know how it's going! Disclosure: I received products from Johnson & Johnson Healthcare Products Division of McNEIL-PPC, Inc. and The Motherhood as part of my participation in the LISTERINE SMART RINSE Sweet Smart Challenge. All thoughts and opinions expressed in this post are my own.